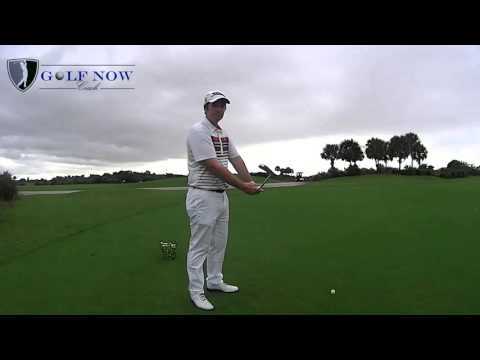 This video will show you how to hold the golf club, the professional way. We will show you how to grip the club in the left hand correctly, and how to identify if you have a strong, weak or neutral grip. We then show you how to carefully position the right hand on the club, and explain between the 10 finger grip, the overlap grip and the interlocking grips. which are the most popular grip styles. COMMENT below and let us know if you have any questions or feedback on the video, and if there are any other videos you would like to see. www.GolfNowCoach.com to receive more tips, guides, and new instructional items, videos, to take your game to the next level. The grip is one of the most underrated fundamentals in golf. Your bodies only interaction with the golf club is through the grip and it allows you to apply proper forces and torques to the club. The left hand grip should see the golfer holding club in their fingers, running from the middle of the of the left index finger to the base of the fingers. The heel pad (bottom right of your hand) should sit on top of the club, never to the side. . If the heel pad of the left hand is on the side of the club it will be almost impossible to square the club face up without making serious compensations along the way. A good check for this is to hold the club with just your left index finger and with the heel pad of the same hand on top the club should be in a stable position and not slip out. From here, close up your remaining fingers. Your last 3 fingers should be now 90 degrees to the grip and they should be holding the club. To ensure this is the case make your left thumb a bit shorter and you will see what I mean. . You should not be able to see at least 2 to 3 knuckles on the back of the left hand and the V formed between the club and forefinger should be pointing towards your right shoulder. The Neutral Left Hand Grip. The best way to check the strength of your grip is to hold the left arm straight out holding the golf club with the club at 90 degrees to the arm. Get the back of your left wrist and forearm perfectly flat and from this position try to get the club face to match the left wrist angle. When they line up your grip is neutral. If the toe is pointing down your grip is weak relative to your face and if the toe is pointing up, your grip is strong relative to your club face. Personally I like to see the grip more towards the strong side, allowing the club to approach the ball in a stronger position which promotes an in to out swing path and a shallower angle of attack. Get the lifeline of the right hand and match it up with the thumb of the left hand. You can create a water pistol with the right forefinger and thumb and point it down the grip. Create a little gap between the last fingers with the thumb at a 45 degree angle. The right hand should now be placed on the shaft with the left thumb being covered by the meat just under the right thumb. This should form a crease between your right thumb and forefinger that points in the direction of your right shoulder. The middle two fingers of the right hand should be holding the shaft,again allowing your wrists to hinge, flex and extend which is critical for speed and therefore distance. You want to have enough grip pressure to hold the club in place throughout the swing but no so much to the point that you are causing your muscles to tense dramatically. 1) Baseball grip – this would only be recommended for golfers with smaller hands such as junior golfers and ladies. This is where you would have all 10 fingers holding onto the club. 2) Interlocking grip – used by many of the best golfers in the world such as Jack Nicklaus and Tiger Woods. This is were your interlock the index finger of the left hand with the small finger of the right hand, with the rest of the fingers holding the club. 3) Overlapping grip / Vardon grip – this is one of the most popular grips which is ideal for someone with big hands. This grip would see the golfer have the left hand on the grip and the small finger of the right hand rest on top of the index finger of the right hand. How to grip the golf club? How to hold the golf club? Is my grip too strong or too weak?